Hi everyone and Happy Friday! We made it! I have a lot of fun plans this weekend and can't wait to share. 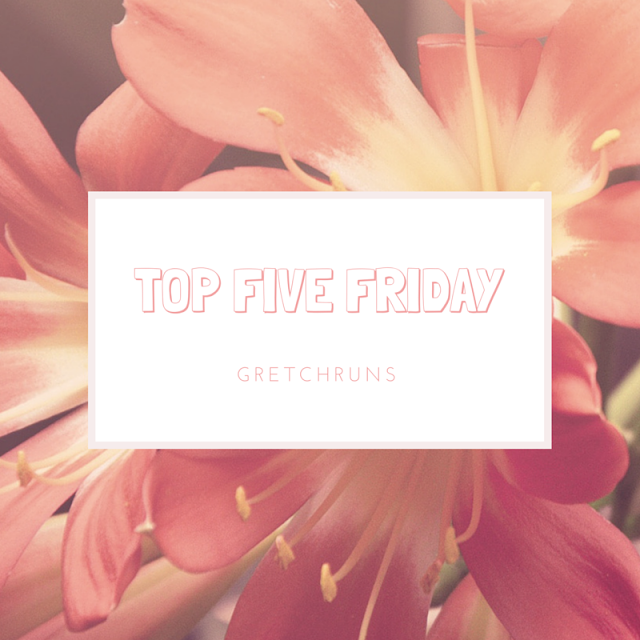 For now, I'll be talking about my top five favorites of the week. I hope you all have a great weekend! Last week, I got a FitBit from work, and I've been loving it so far! I love how you can challenge your friends (add me if you're on!) and I've already become a lot more active at work. I got the Charge, and I love how you can see exactly how many steps and miles you've gone, as well as calories burnt, floors climbed, and the time! It also tracks your sleep, which was interesting to see (apparently I'm restless a lot throughout the night). I absolutely love having Amazon Prime, especially when I find a new perk. I just found out about Kindle First- four books are chosen each month as the editors' picks, and prime members can download one free every month. That's amazing! I especially liked this because I've never heard of any of these authors or the books, so this was a great way to find new things to read! I've mentioned the Run Club in the past, but I have to mention it again because it's so fun! The club meets every Wednesday and Saturday at True Runner in Shadyside. Not only do you get a $20 gift card to the store after attending 10 runs, but the club also hosts tons of fun events. This week was the Pub Run- after running 4 miles we got a free beer from the Shady Grove, with a $2 special after that. It was so fun! I love running with this group and there are lots of paces available- from 7:00 to 12:00. (I'm not sponsored by True Runner or anything, just want to share it for you yinzers out there!) I believe that other True Runner locations also host runs, so check out the website, click your location, and click on events to find the next one! Oh my goodness..this stuff is AMAZING! I mentioned it briefly in my first WIAW post, and I've been obsessed with this ever since then. I've tried it hot, cold, and mixed with coffee..all amazing. I can't believe I've gone so long with out trying this, but it's definitely a staple in my TJ hauls from now on! First of all, I absolutely LOVE Mindy and have supported every project of hers, from her book to her shows, and I was so excited to hear she was the special guest on my favorite podcast this week! She is so hilarious and just seems like an all-around great person and someone I would definitely love to be friends with. I think I'll have to add her to my hypothetical dinner table group next time I'm asked that question! If you want to hear this week's podcast, you can listen here. So many things wrong with this episode...Ian being a major jerk (really disappointed because I really liked him in the beginning), Nick still creeps me out, the camera men staying right outside Kaitlyn's room...so, so unnecessary. I really respect how Kaitlyn's been dealing with the backlash and taking it all in stride. I follow her on Snapchat and she had a great response and said "my only message is do you bro". While I may not make the same choices as her, I'm not going to put her down or make rude comments about her. Do you! Such amazing acts this week, especially the roller blading trio! That was just crazy. I felt really bad for Jeff..his partner (Ciara) ditched him most of the week to do promo for her new album. It doesn't really seem fair that someone signed up for the show knowing they couldn't be dedicated to it. I guess it's not surprising that she's in last place. SO excited for the show this year! There are a ton of dancers that are amazing..like give me chills and goosebumps amazing. I think it's pretty evenly matched between the street and stage, but I think the street performers have an edge in the personality/originality department. It'll be interesting to see how the live shows go! Any other BB lovers out there? When the new season starts it signals the beginning of summer for me. I can't wait to get into this season and figure out who my favorites are! Based on the first episode, I'm loving Da'Vonne..she is hilarious and I think could get really far in the game as long as she doesn't miss her baby too much. Clay is also adorable and seems like a sweet guy. I keep seeing commercials for the upcoming season, and I'm SO excited to watch! There are some big celebrities on this season (including James Marsden and Kate Hudson..my favorites) so I can't wait to see how they do in the wild! Counting down the days till July 13!! I absolutely love Leona's voice, and have been listening to her music non-stop at work this week. This song is so beautiful! I have to credit this song to Dan, whose favorite band is Rush. I really like this song, especially to pump me up during a run! Oldie but goodie for sure. Someone danced to this song on SYTYCD (which was beautiful) and I loved how interesting the song was! There's piano, cello, and lots of electronics. SO cool! This song is so great, especially if you know the story behind it- Joel wanted to write a song to help young people who were struggling with depression after attempting suicide himself. He thought the first version was too sad and depressing, so he re-wrote it to be happier and bouncy. He also donated all the song royalties to the National Committee for Youth Suicide Prevention..amazing! I've loved Nate's voice ever since Some Nights came out, and I'm in love with his new album. There's so much string music in the background, and each song is beautiful. I especially love his duet with Beck (those harmonies!!) and Brightside. I hope you all have a great weekend!! Tell me what you're up to! I love my Fitbit! Same model. My favorite is being able to see the HR info while I run. (I'm not on snapchat). I haven't heard that Billy Joel song in years! I actually didn't get the charge HR and I regret it! Mine is just the regular charge without the heart rate info. Definitely just added you on Snap Chat :) Also, I just moved away from a TJ's, so you must must must send me some of that chai latte mix! Through like teleportation or something? K cool. Added you back! If you send me your address I will for sure send you some chai mix...it's so good so I can't deny you! 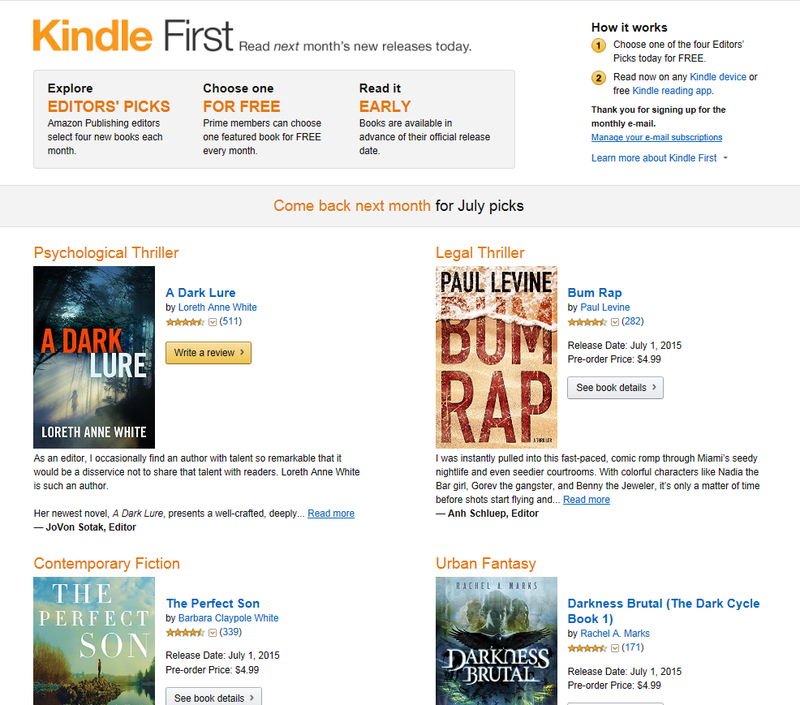 Totally joining up with True Runner when I move back to Pittsburgh, or maybe just next time I'm home visiting! Those nuts!!! (Insert heart eye emoji here)! Must try asap! That's awesome!! Let me know if you're coming :) hope your race this weekend was great! I love love love love LOVE Nate Reuss. Nothing Without Love is absolutely brilliant. I just downloaded the whole album. Yay! LOVE that show! That's the only reason I'm still tolerating the bachelorette ..so funny seeing the similarities! You should!! And add me..we can keep each other accountable :) hope your half went well!! 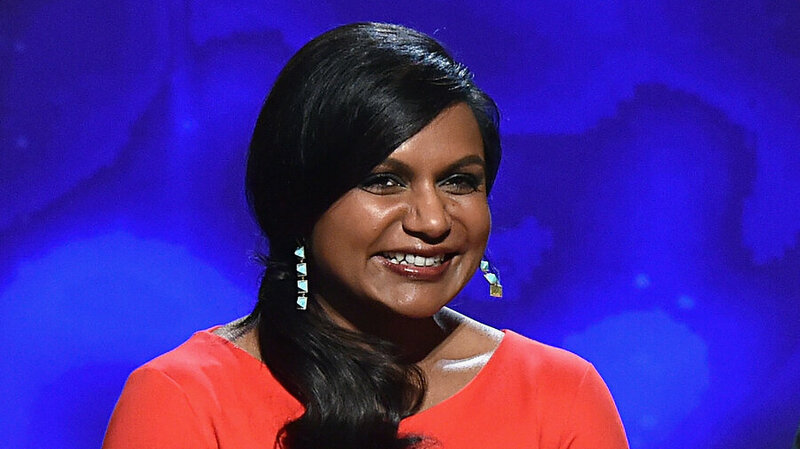 I enjoy Mindy too. I never watched her show faithfully cus I didn't ever know when it was on but I would watch if I came across it on tv. Oh, the Bachelorette. Lets just say Kaitlyn would have not been my first pick. I just think she is lacking a sense of charm. I gotta hand it to her though for keeping things real! Hahah I agree about that..I like Kaitlin's style though! Something different. Amazon Prime is one of the most fantastic things. Love it. Really enjoy tracking my steps. First with a fitbit, but now I have a Garmin vivoactive, that I LOVE. Ah cool I had no idea. I hope you like the chai if you end up getting it!